Jesus was in a house in the town of Capernaum (kuh PER nih um). There were so many people in the house that on one else could even get in the door! Some men brought their friend to Jesus. The man was a paralytic (pair uh LIT ik). He was paralyzed and could not move. His friends believed that Jesus could make him well, but they couldn't even get in the door. They had an idea. They would find another way into the house. If they could get up on the roof, they could remove a part of the roof and make a hole above the crowd. That is just what they did. 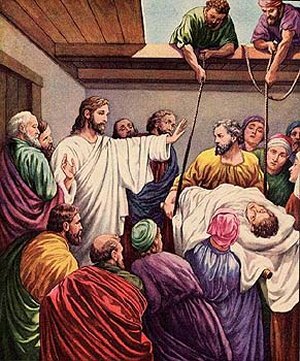 Then they attached ropes to the bed on which their friend was lying and slowly lowered him down into the room, right in front of Jesus! When Jesus saw their faith, he said, "Son, your sins are forgiven." Some Jewish leaders were sitting there and they were thinking, "Only God can forgive sins. How can this man tell him that his sins are forgiven." Jesus knew what they were thinking. He said, "Which is easier, to say 'Your sins are forgiven', or 'Take up your bed and walk'?" Of course the easier thing would be to say, 'Your sins are forgiven'. Jesus was God and really could forgive sins, but there would be no way to prove if this had really happened. So to prove to them that he could forgive sins, He did the harder thing. He said, "Take up your bed and walk." And the man who had been unable to move, stood up and walked. Everyone could see what had happened as a result of Jesus' words. The people could hardly believe their eyes. They had never seen such power! We can learn a lesson about friendship from this story. The lame man had some very good friends. They were determined to get their friend to Jesus. They even pulled him up on top of the house and made a hole in the roof to bring him to Jesus. You can be such a good friend. If your friend knows Jesus, you can encourage him or her. If they do not know Jesus, you can look for ways to bring them to Jesus as the four friends in the story did. Invite them to go to Sunday school or to Vacation Bible School with you. Share the lessons that you have learned with them. Always set a good example for your friends by doing the right thing. 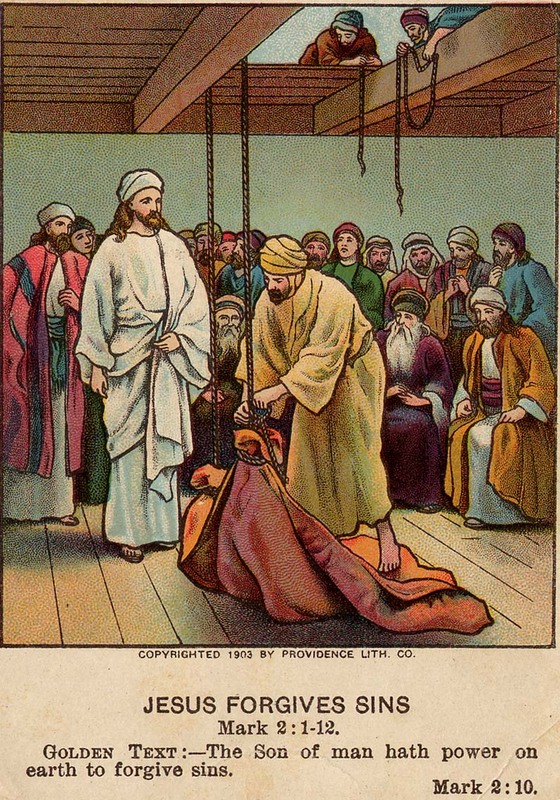 English Bible Activities Select story #180 in the list for activities to accompany this Bible story. Spanish Bible Activities Select story #180 in the list for activities to accompany this Bible story. Thanks so much for sharing this! I love the song, and plan to use it when I teach this lesson next week. =D God bless! This was a very good lesson! I really liked the way there were so many "activities" with each lesson. Thanks so much for a really good sight on which to build a great Sunday School lesson. This page displayed 215,491 times.